Sometimes drivers almost appear to be asking for police to pick them up on charges of DUI in Los Angeles. They hit signs, drive the wrong way on a one-way street or make some other ridiculous move that calls officers’ attention to their driving. Police in Riverside, Illinois, didn’t have to search too hard to find 28-year-old Joseph T. Whetter, who allegedly had been driving under the influence. All they had to do was follow the wide path of destruction that Whetter reportedly left as he careened through a local neighborhood. The Woodridge, Illinois, Patch said that police received multiple 911 phone calls around 2 in the morning of March 19th from area residents who had heard (or seen) the damage that Whetter was wreaking. 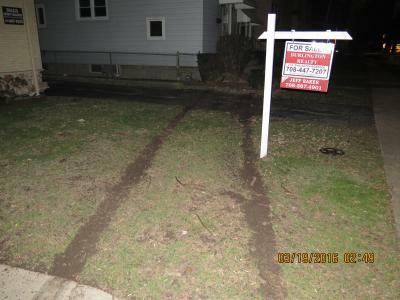 He supposedly drove on sidewalks and through several front yards, then hit a landscaping wall that sent him back onto the road. But he didn’t stay on the pavement for long; he ended up hitting bushes and narrowly missing a For Sale sign at a nearby house before the officers caught up with him. Both front tires of his vehicle had been blown out. According to the Patch report, Whetter was so far gone that he couldn’t stand up when police ordered him out of the car. Not surprisingly, he failed sobriety tests (both at roadside and back at the police station). A breathalyzer test measured his blood alcohol content at 0.163, more than twice the legal limit. Whetter faces a variety of charges after his erratic trip through the yards of Riverside. They include failure to reduce speed to avoid an accident, driving on the sidewalk, improper lane usage, driving on a license that expired more than a year before and possession of cannabis. Press reports didn’t mention whether Whetter was also under the influence of cannabis when he was driving, but if he lived in California, it wouldn’t make any difference with respect to the charges he would face. Under California Vehicle Code 23152 (a), the punishments for DUI due to alcohol or to pot use are effectively he same.